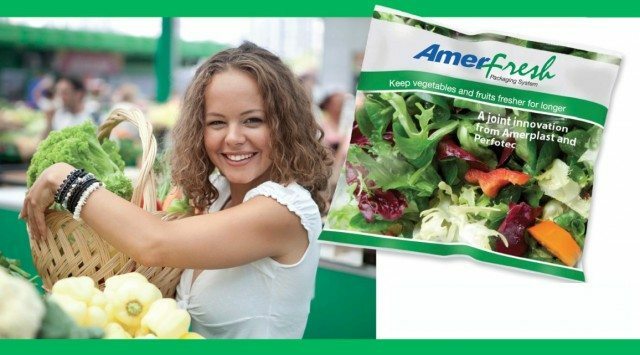 Amerplast and PerfoTec will introduce AmerFresh, a new packaging system that enhances the shelf-life of fresh produce at Fruit Logistica in Berlin from February 3-5, 2016. The packaging system uses research and development intelligence specific to fresh-cut vegetables and fruits, Amerplast high-performance film and printing technology and the Perfotec laser perforation system, for working synergy with fresh-cut packing equipment. One of the key variables for fresher produce is the optimization of oxygen levels within the pack, tailored for each type of vegetable and fruit. The packaging system can inhibit as much as possible the biochemical reactions in fresh produce through better packaging architecture, delivering fresh-cut vegetables and fruits with a longer life cycle. The PerfoTec technology enables individual measurement and tools for optimal oxygen respiration rates for each produce. The two companies first announced their co-operation at the 2015 Fruit Logistica Trade Fair. The unique PerfoTec technology and equipment have since been installed at Amerplast’s Tampere site in Finland. “We have developed a wide range of film options and thicknesses for different fresh-cut vegetables and fruits, to meet different customer requirements,” says Børge Kvamme, CEO Amerplast. “Our micro-perforated laminates offer excellent film permeability, allowing efficient mix of barrier and breathing properties.